On Thursday evening, Andy Bisek (Minnesota Storm) and Kim Hyeon-woo (KOR) will meet up in Times Square at the annual Beat the Streets Gala. Bisek (world no. 5) and Kim (world no. 3) represent two of the very best at 75 kg, making this battle a potential precursor to a match with far more implications later this summer. Bisek, the popular, talented two-time World bronze medalist, is largely seen as a favorite to find the podium in Rio. 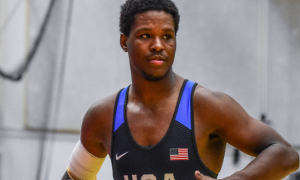 Kim, for his part, has already experienced the high of high’s, having won gold at both the 2012 Olympics (66 kg) and 2013 World Championships (74 kg), respectively. However, there is nothing on the line tomorrow night in Midtown Manhattan. It’s an exhibition of sorts, a way to get these athletes under the bright lights for the world to see. A “one-off.” But that doesn’t make the probable action fans may witness any less compelling. US Greco Roman fans have become accustomed to what Andy Bisek is all about. The gutty Minnesotan has spent most of the last decade on an upwards trajectory. You could almost trace it in steps over the last six years. Placing at but not winning the World Team Trials; winning some domestic tournaments, but not all; strong appearances internationally and then maybe a hiccup. But something changed. Those “strong” international appearances got stronger. Those domestic tournaments began to belong to him, his abilities blending with his potential. From an observer’s perspective, Andy Bisek’s style borders on both frenetic and calculated. On his feet, the 29-year old goes after his opposition by looking to control the ties in order to impart angles. Bisek, thanks in large part to his physical strength, is also very adept at upsetting an opponent’s balance, even off of counters. He doesn’t just peel off attempts – he does his best to make you immediately pay for having the audacity to set something up. It is sometimes like watching a hockey enforcer who doesn’t want to waste time throwing off his gloves, with just a touch of European flair. We actually covered Bisek’s go-to offense before but it is worth looking at again. If there is one area of Greco Roman wrestling at the international level Americans have struggled with, it may be par terre offense. That being said, it is a position that has become a focus for the Minnesota Storm wrestler. His hard work has paid off and then some: Bisek has two World bronzes and his gutwrench played a vital role in each of them. A gutwrench is a grinding, unforgiving hell to be caught in when someone can apply it correctly. What Bisek can do is set the table with a lock immediately from par terre and if he cannot find the pocket to turn, he will straddle it up and lift. One way or the other, he is likely going to find a way. Not exactly on the flipside resides Kim. Like Bisek, Kim Hyeon-woo could be defined as a “charger.” Very rarely will you catch Kim off his base or on his heels. In fact, that commitment to staying forward has been an advantage for the Korean, especially when he is stymied from scoring standing up. His constant pressure has been responsible on plenty of occasions for awarding him offensive par terre chances and when the rules changed to the current system, he adjusted accordingly. That doesn’t mean he doesn’t try to score on his feet. Oh, he does. Kim sports a lightening-quick arm throw that he can find even if there is a fair amount of distance between he and his opponent. Clinched up, he is a “weaver” and completely unafraid to pummel into an opponent’s strengths (see: Valsov, Roman). At times he really tries hard to get his left foot outside of his opponent’s right foot to create an appropriate angle. Plus, the dude just wrestles like he’s battery-powered. When it comes to his par terre game, Kim doesn’t deviate too much. He’s got a gut, which on occasion he may try and reverse, if not just to loosen up his opposition’s hips. But more than anything, like most wrestlers he goes conventional first. It’s not the “I’m going to try and kill your insides” type of lock that Bisek has, but it is just as effective. Kim keeps his legs moving. In fact, that should be his constant theme from all positions. His legs are such a giant part of his arsenal. In terms of his lock, Kim will actually jut up from the belly towards the sternum in a quick motion as another method for him to create space and get his bottom half churning. Bisek is about “polished punishment”; Kim is about “chained aggression.” Essentially two sides of the same coin. 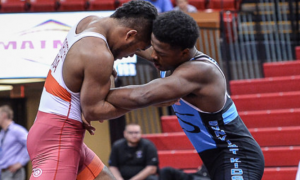 Beat the Streets is featuring only one Greco Roman match and while it would be nice to see more of them tomorrow, you couldn’t do much better than this contest. It has everything fans want to see: Two highly-skilled and accomplished world class competitors who are both in their primes gunning it out in a unique, electrifying atmosphere. The best part is that there are more questions than answers. Nothing is assumed. Can Bisek upset Kim’s pace often enough to find scoring opportunities? Can Kim stop Bisek from turning him when it gets to par terre? Kim might have the hardware, but Bisek has been on a very different level the last couple of years in his own right. He’s fought his heart out and has become superbly confident in his status as one of the planet’s best Greco wrestlers. Kim, on the other hand, didn’t have a great showing at the Worlds last year but certainly looked plenty strong at the Asian OG Qualifier in March. Simply put, there is a lot to love about all of this. It might not be for all of the proverbial marbles. Surely, no one is getting a medal thrown around their neck for winning in Times Square tomorrow. Plus, as US National Team Head Coach Matt Lindland pointed out, it’s a “showcase.” That is okay. Greco needs more of these. And one way or another, tomorrow night there will be a show. It might only still be May, but the lights couldn’t be brighter. The Beat the Streets Gala featuring Andy Bisek and Kim Hyeon-woo will be broadcast live on FloWrestling.